It’s always great to see how our customers are using our products in different styled kitchens and bar areas. Not only does it demonstrate the latest interior trends, it also helps and inspires others to choose a design that will suit their own space. 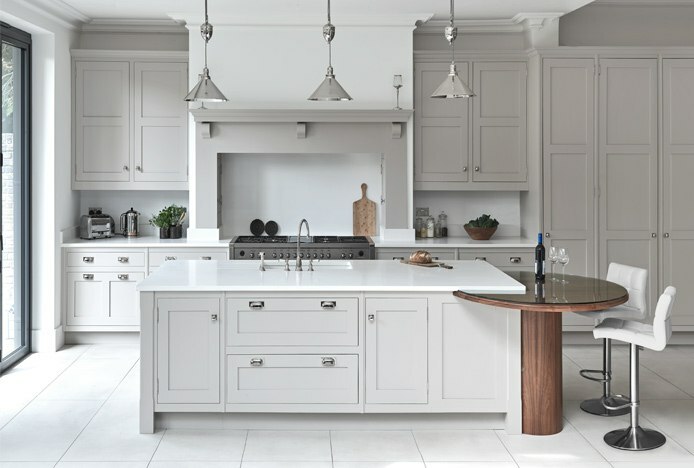 In this article we show you seven different kitchens that feature our bar stools and discuss what makes them a brilliant choice for each one. This period kitchen has both classic country style and modern metallic elements, providing a myriad of choice for complementary kitchen stools. The fixed height Healey Stool Grey is a really clever addition to this bar area. With its frame upholstered entirely in grey faux leather, it almost blends into the grey island, which spans over three metres and fills this large space beautifully. Plus, its four-legged design enhances the traditional look whilst showing off the fantastic wooden herringbone flooring. Centred around the chimney, this monochrome kitchen adds interest with its different surface textures. 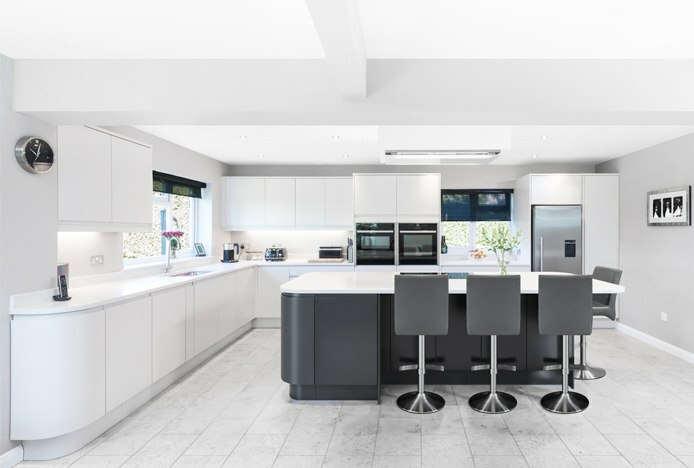 The island features a cashmere white granite top, whilst the worktops are topped in absolute black granite and marble brick bond tiles form the splashback. The cool tones are contrasted by brushed brass pendant lighting and distressed copper taps and accessories, which creates the mixed metal look that is extremely popular right now. 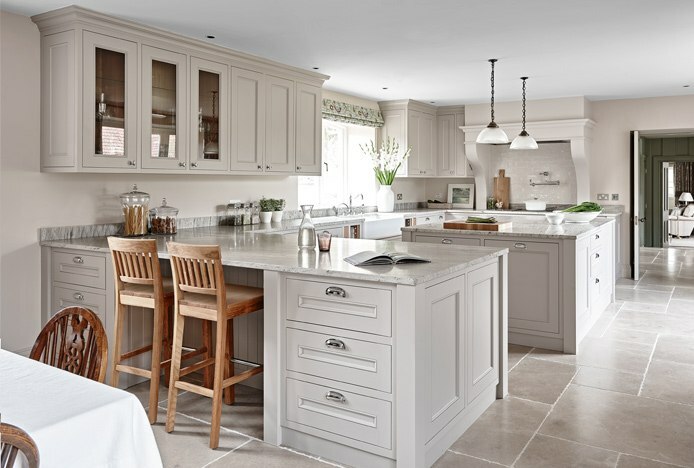 With classic style influences, this kitchen boasts a light and neutral colour scheme with traditional shaker style cupboards. Then, modern finishes are added with the brushed steel range cooker, pendant lighting, and accessories. Our Starz Brushed Real Leather Stools therefore complement the colour scheme, whilst adding a contemporary look to the wooden room. The stools also tie in nicely with the cupboard doors and the linear bond floor tiles, as the grid pattern is reflected in each of these elements. A big trend for 2018 is creating a contrasting feature island. This is a great example, as the bar area stands out from the angular design of the room with its circular shape and dark wood finish. Whilst this instantly draws your eye to the seating area, the position of the seats means there’s also a perfect view of the garden through the patio doors when seated. Similar in design to the previous example, this open kitchen has classic shaker style. However, the Barrington Oak Stool has been chosen to complement this modern traditional look. The stools rectangular chrome knocker and chrome studs work well to modernise the space and complement the chrome lights and door handles too. Plus, the fabric-upholstered seats are a great choice to soften the look of this wooden space. Meanwhile, the oak finished wood legs match the island worktop and the dining table, which features matching Barrington Oak Dining Chairs for a cohesive appearance. This sets up a really sociable environment between the host and the guests. The dining table even looks out onto the garden through the bifold doors, which let in plenty of natural light and work with the skylight to create an open and airy feel. Here is a great example of a true contemporary kitchen. The minimalist sleek surfaces and clean lines call for equally stylish and minimalist seating. Not only does the brushed steel finish of the Deluxe Brushed High Back sit in harmony with the appliances, it also makes a perfect accompaniment for the cool grey and white colour scheme. Again, the large island is a feature in this space, standing out in dark grey and forming a chic backdrop for the stools. The modern angular design is present throughout the space, from the brick bond linear floor tiles to the framed photography breaking up the large expanse of wall. Then, the rounded edge of the worktop and the circular bases of the stools offer a soft contrast to the look. With its traditional farmhouse style cabinets and Belfast sink, wooden bar stools are ideal for this kitchen. The classic fixed height design of the Grasmere Stool works beautifully with the country feel, and it echoes the timeless spindle design of the wheelback dining chairs in the foreground of this image. Interestingly, the seats are the only natural wood elements of the room, adding warmth to the cooler colour scheme. Connecting through to the living room, your eye is drawn through the kitchen, making the room look even longer. And, although there’s a large island, the stools are sat at a peninsula instead, creating a clear divide between the seating areas and the cooking area to provide ample room for everyone. Plus, with such low ceilings, the Grasmere makes a great choice with its low and open backrest design offering a less intrusive option. 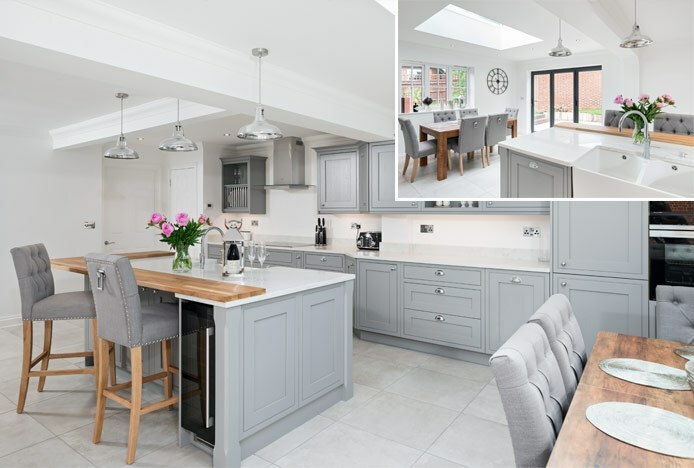 Full of natural light from three large skylights and patio doors that span the length of the room, this London Townhouse kitchen has a really open and modern look. Showcasing clean-cut lines and straight edges, the linear design of the Lush Real Leather Brushed is ideal for this space, especially with the square bases complementing the linear bond floor tiles. 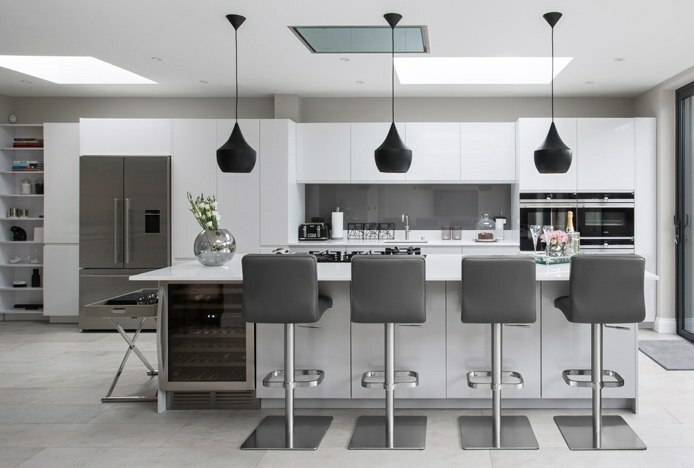 What’s more, the grey faux leather harmonises the white units and black accent pendant lights, bringing a stylish mid tone to this contemporary scene. Plus, the brushed steel frames work well to match the appliances, including the wine fridge – ideally placed on the island for convenience! 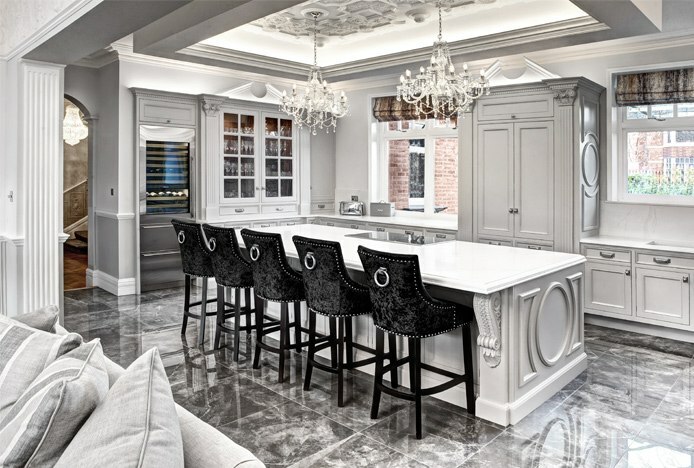 Such an elaborate and ornate kitchen needs opulent furniture to match. Therefore, the Ascot Bar Stool is the perfect choice. Its sparkling crushed velvet, chrome stud edging, and ring knocker detail are wonderful accompaniments for the mirrored marble flooring and crystal glass chandeliers. Decorative mouldings adorn this space, from pediments and pilasters on the cabinets to acanthus leaf corbels supporting the overhang of the bar area, and even the ceiling is ornamented! This neo-classical design follows on into the open plan living area, creating a grand and glamorous setting. Even so, the Ascot still makes its own statement with five stools fitting comfortably at the huge three-metre island, perfectly positioned for conversation with the cook. So there we have it, seven different kitchens with seven different bar stools demonstrating how your choice of seating can completely mix up the look of your room. 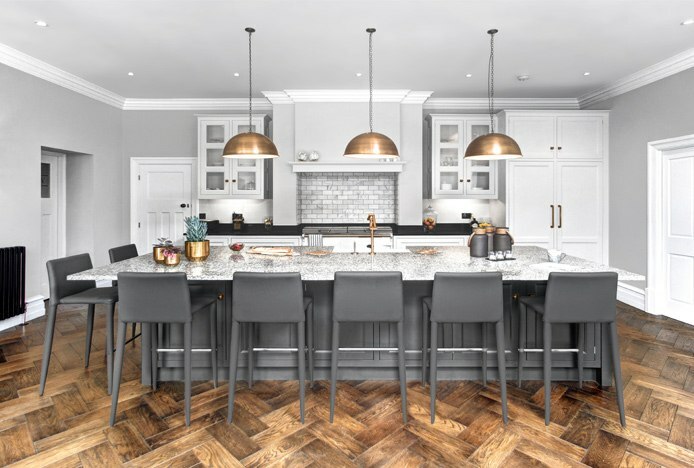 Even though everyone has different tastes and what works for some may not work for others, it’s good to know that just because you have a traditional wood kitchen doesn’t mean you can’t have modern metallic stools. Break the mould and mix different metals in your kitchen to add charming personality..